David William Deason was born on July 25, 1894, in Union County, N.C., to Samuel and Louise (or “Lou”) Deason. By 1900, the Deason family was living in across the North Carolina-South Carolina border in Chesterfield County, S.C., where Samuel Deason worked as a farmer. The family was still living in Chesterfield County as of 1910. By 1913, David Deason had come to live in the town of Marshville in Union County, N.C. On December 27, 1913, David Deason enlisted in the U.S. Navy at the U.S. Navy Recruiting Station at Richmond, Virginia. He entered with the rank of Seaman Apprentice. 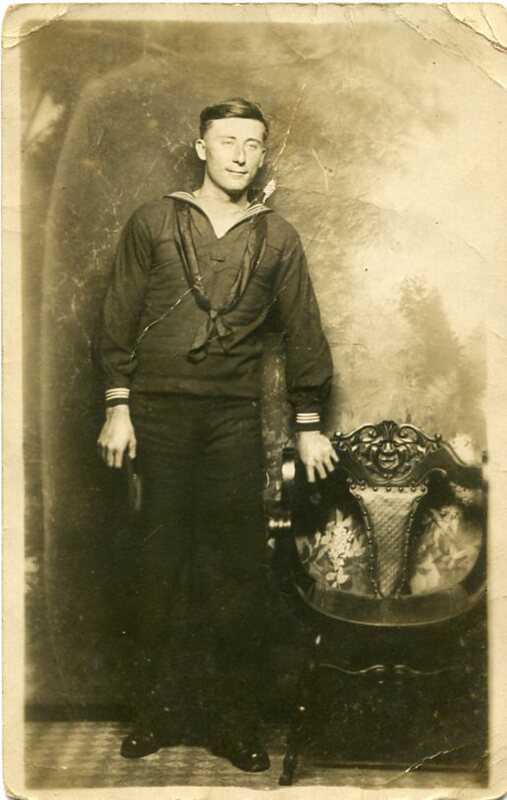 Nothing is known of his Navy service until the United States entered World War I in 1917. When the U.S. entered the war in April 1917, Deason was serving aboard the USS Neptune (Fuel Ship #8), as of April 6, 1917. He remained aboard the Neptune through the end of his four-year Navy enlistment period, when he was discharged on December 7, 1917, with the rank of Seaman. On December 8, 1917, Deason re-enlisted after his discharge at the U.S. Naval Station in Hampton Roads, Virginia, with the rank of Storekeeper Third Class. Deason would serve aboard the Neptune for the rest of WWI, reaching the rank of Storekeeper Second Class by the end of 1918. Prior to WWI, the USS Neptune operated along the east coast of the U.S. and in the Caribbean Sea from Boston to Guantanamo Bay, Cuba, supporting American ships and installations of the U.S. Navy’s Atlantic Fleet through 1913. The Neptune was commissioned with a naval complement on December 7, 1914, and resumed collier service with the Atlantic Fleet. Between December 28, 1915, and 1917, the ship made four voyages to Santo Domingo, Dominican Republic, between June 1916 and February 1917, carrying U.S. Marines, fuel, and mail to support U.S. Navy and Marine Corps units protecting American interests in the Dominican Republic during unrest there. When the U.S. entered World War I, the USS Neptune was docked at Baltimore, Maryland, loading general cargo. After departing that port, the ship put into Norfolk, Virginia, to embark a division of the U.S. Navy’s 1st Aeronautical Detachment, sailing on May 25, 1917, for France escorted by destroyers USS Jarvis (DD–38) and USS Perkins (DD–26). After arriving in St. Nazaire, France, on June 8, 1917, the Neptune offloaded its cargo and disembarked the troops, which proved to be the first American forces to land in Europe for service against the enemy in WWI. The Neptune sailed for home on June 28, 1917, arriving in New York on July 11, 1917. The Neptune resumed its service with the Navy’s Atlantic Fleet, making one voyage to the Caribbean from July 12 to August 27, 1917. It then operated off the Atlantic Coast of the U.S., delivering coal to ports in the Chesapeake Bay through the end of the WWI. It was primarily involved in fuel delivery and troop transport for the Navy in the war. 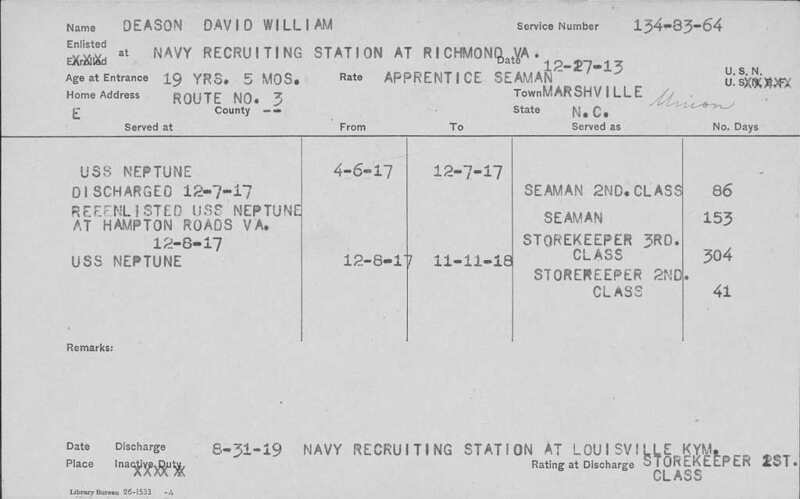 David Deason was honorably discharged from WWI Navy service on August 31, 1919, at the U.S. Navy Recruiting Station at Louisville, Kentucky. Little is known about him after his WWI service. However, Deason continued to re-enlist in the U.S. Navy, and would serve as career Navy until he retired later in life by the 1940s. He was married and had children, but would later get divorced. While serving in the Navy on May 28, 1929, Deason was admitted to the U.S. Naval Hospital in St. Thomas, the U.S. Virgin Islands, from the U.S. Naval Station at St. Thomas. Deason was admitted with the listed condition of paranoid psychosis (although the exact meaning of this condition in 1929 medical terminology is unclear). He remained in the hospital until being released on June 24, 1929. By the 1940s, Deason had come to live in the town of Mt. Holly in Gaston County, N.C. David W. Deason died on March 14, 1945, in the town of Catawba Springs in Lincoln County, N.C. He was buried in Mount Zion Baptist Cemetery in the small community of Alexis in Gaston County, N.C.
[Historical information on the operations of the USS Neptune taken directly from the Dictionary of American Naval Fighting Ships, U.S. Department of the Navy].